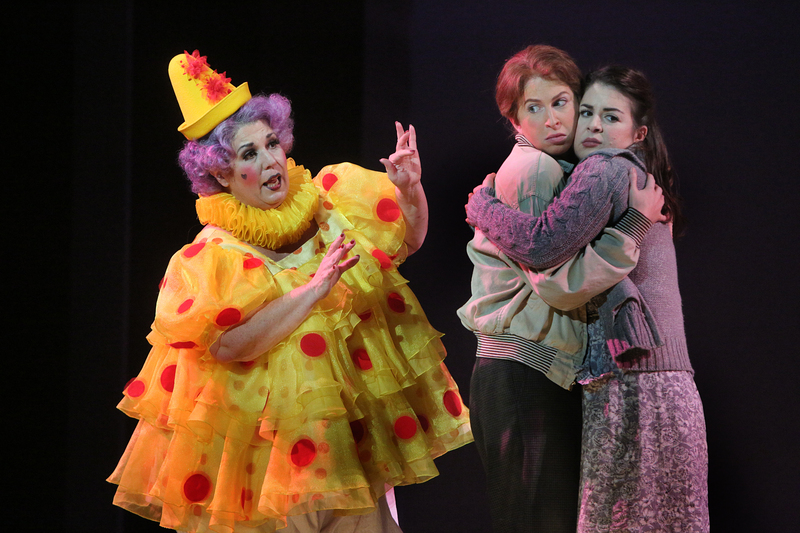 The Minnesota Opera’s production of Hansel and Gretel is a great introduction to opera for friends and family who are intimidated or reluctant to give the form a try. The story is familiar, the music is approachable (and lovely), and the staging is fantastic – in all definitions of the word. This production of Hansel and Gretel is also a treat for opera lovers – more nuanced and compelling than one might imagine considering its subject matter. Composed by Engelbert Humperdinck (the German born in 1854, not the strange British pop star), the music is lush and melodic. Themes are repeated and varied and provide footholds and comfort for the novice listener. But it’s far from simple or cloying. Requiring a large orchestra, the sophisticated composition uses counterpoint and complex harmonies, and requires strong singers. Both children’s parts are sung by women. Humperdinck was the first composer to use Sprechgesang, a vocal technique halfway between singing and speaking (later used by Schoenberg). Hansel (Stephanie Lauricella) and Gretel (Angela Mortellaro) are in constant and gorgeous conversation throughout. The range and clarity of the voices of Lauricella and Mortellaro are a great match for the demands of the parts. Marianne Cornetti sings the part of both the mother and the witch, and her mezzo soprano is bold and and beautiful. Though the opera doesn’t contain the heightened arias of composers such as Verdi or Puccini, the score and singing are captivating. Humperdinck’s sister, Adelheid Wette wrote the libretto. She lightens the narrative considerably. The original Grimm fairy tale makes a monster of the mother and a spineless lout of the father. Instead of being abandoned in the woods by their parents, this Hansel and Gretel are sent to pick strawberries in the forest by a legitimately angry mother who doesn’t realize or doesn’t remember that an evil witch lives there. The father (Craig Irvin) returns home drunk, but is portrayed as well meaning and protective of their children. The parents head out into the woods in search of Hansel and Gretel. With the introduction of Sandman (Shannon Prickett) and Dew Fairy (Siena Forest), the libretto moves more magical than sinister (at least compared to the original folk tale). 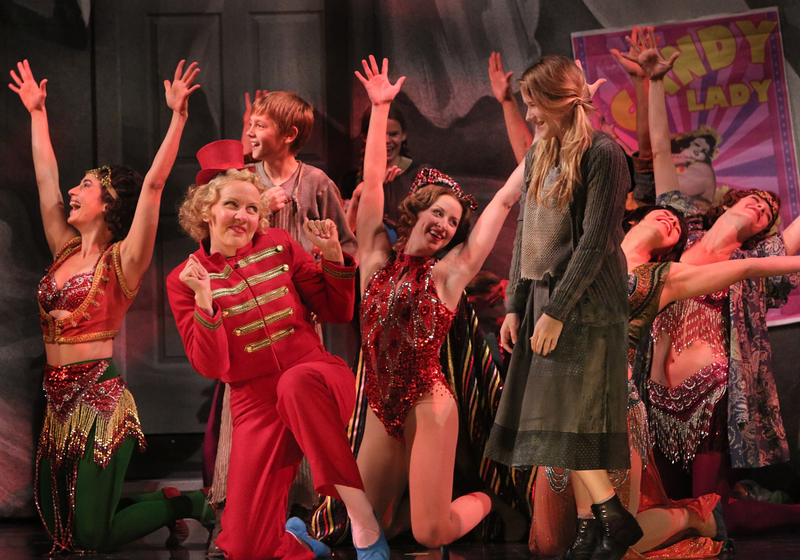 The creative team takes the category of Fairy Tale Opera to heart. Setting the opera in a vague early 20th Century (cued by a a portrait of Ginger Rogers and Fred Astaire painted across a building), the team introduces a traveling circus. The circus performers, danced wonderfully by the Zenon Dance Company, first seem innocent enough, and are gradually revealed as complicit in the witch’s diet of children. The changing sets, particularly the place known as “Playland” and the witch’s house are inspired, walking a remarkable line between the whimsy of the circus and the malevolence of a carnival. And the portrayal of the witch is deeply creepy, and the ending which includes what you would expect and some things you wouldn’t is eerie – the spirit of the Grimms is never too far away. When the curtain opened, I was mildly skeptical – of the setting of the time period, of the creative approach, of the role of the circus. And I wasn’t familiar with the music. The opera and the Minnesota Opera’s staging made loving the production easy. Hansel and Gretel. Music by Engelbert Humperdinck. Libretto by Adelheid Wette. Conducted by Anne Manson. Presented by the Minnesota Opera, November 1, 2, 6, 8, and 9, 2014. Information at http://www.mnopera.org/season/2014-2015/hansel-and-gretel/.